Yarker’s Blair Morgan is bound for Italy next month as a member of Canada’s team at the 20th world student cross-country championships. The FISU event, staged every two years, is being held March 12 in Cassino, about 140 kilometres southeast of Rome. A fifth-year chemical and biochemical engineering student at McMaster, Morgan, an Ernestown Secondary School grad, is the only one of the six members of the Canadian men’s team who has previously raced in a FISU event. He was 43rd in 2014 at Entebbe, Uganda. Racing in Italy will be the cap on a splendid intercollegiate career at McMaster for Morgan, who was sixth at last fall’s Ontario University Athletics championship, but the third Ontario runner across the finish line at the subsequent Canadian Interuniversity Sport championship, where he placed eighth overall, a place that earned him second-team all-Canadian status. 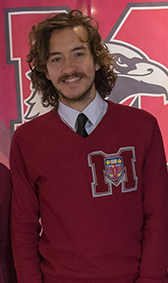 Three times his cross-country team’s captain, Morgan has helped McMaster to provincial medals each of the last three years. On the track, his times in both the 1,500 metres and 3,000 metres rank among the top six in school history. In January Morgan was presented with the Dr. Jack Kennedy Award, as the university’s top male scholar-athlete. Morgan has four times been named to the Dean’s List and last year he received a University Senate scholarship for being in the top 10 per cent of his class. A regular contributor with Mac Athletes Care, Morgan is also involved in McMaster's Let's Talk Science outreach program, sharing his passion for science and engineering with students in Hamilton-area schools. Also on the men’s team headed to Italy are three runners from Victoria, Ryan Cassidy, Olivier Collin and Forrest Simpson, as well as Matt McNeil of Dalhousie and Lakehead’s Kevin Tree. Claire Sumner of Queen’s will be a member of the Canadian women’s team in Italy. She was ninth at the CIS championship last November. Brent Stachel of Queen’s is accompanying the team as an assistant coach. Two years ago in Uganda, the women won the bronze medal, matching Canada’s best-ever result of 2010, when the world student championships were held in Kingston. The men were sixth in 2014, when Canada’s top individual performances were seventh-place finishes by Julie-Anne Staehli of Queen’s and Tristan Woodfine of Guelph. Canada’s best-ever individual results are fifth, by a woman (Megan Brown, 2010), and seventh by a male competitor (Woodfine, and Rob Lonergan, 1982). Canada’s best result in men’s team competition is fourth, also from 2010. Kenya’s men and Uganda’s women are the reigning FISU champions.